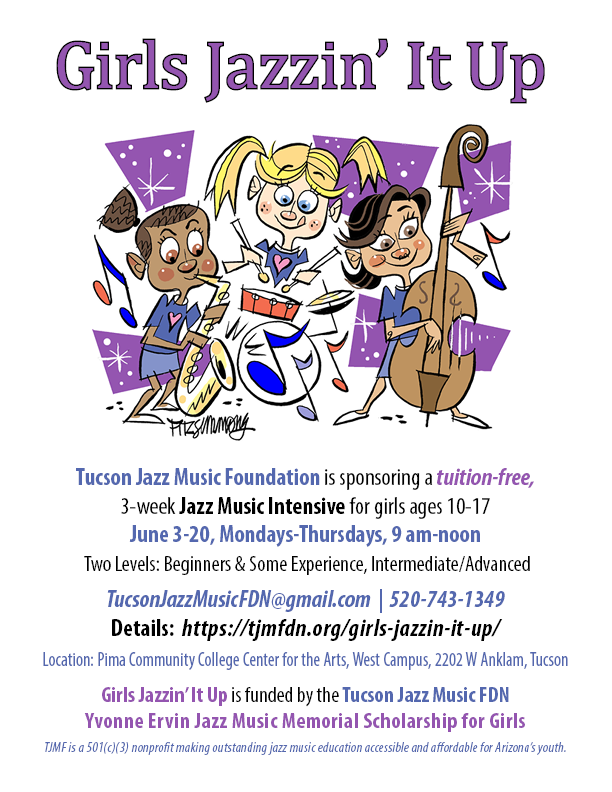 The Tucson Jazz Music Foundation is sponsoring an all-girls (ages 10-17), tuition-free, three-week jazz music intensive program scheduled for the first three weeks in June, Mondays-Thursday, 9 am-noon. Classes will be held at the Pima Community College Center for the Arts, West Campus, 2202 W Anklam Rd, Tucson. More details are included in the Registration Form (link above) and additional information will be released towards the end of April and early May. REGISTRATION DEADLINE: April 29, 2019 (11:59 pm). Will be extended if there is space available. Level I – Beginners / Some Experience – The first day of class must demonstrate minimal instrument proficiency: Play major scales, a jazz song or etude, and, if you can, chord permutations and an improvised solo on a blues. Level II – Intermediate/Advanced – Play 6 major scales, 2 octaves; eighth notes at approximately 1/4 note = 120 bpm; 2 chorus solo on a blues (accompaniment optional). See link on the Registration Form for submitting a short clip by the deadline of April 29, 2019 (11:59 pm).